The Yoga Research Foundation is delighted to announce the first of our special events to be held in April 2019. We warmly welcome you to an enchanting evening in celebration of Ram Navami & Hanuman Jayanti on Sunday April 14th at the ashram of our beloved Guru, Sri Swami Jyotirmayananda. The festivities commence at 5 PM and we hope that you will join us for an evening of delicious vegetarian food, kirtan and bhajan, and an insightful lecture from Swamiji on the Divine Self as expressed through the mysticism of Lord Rama and his beloved devotee, Lord Hanuman. As an appetizer of what you may expect on Sunday, please enjoy the following excerpt taken from Mysticism of the Ramayana where Swamiji expounds on the mystical attributes of Lord Hanuman. Although Hanuman is represented as a monkey because he belongs to the realm of the mind and senses, he certainly is no ordinary monkey. In most people, the mind and senses are like monkeys – ever distracted and jumping from one thing to another. However, when one has unfolded the Hanuman within, all externalized tendencies easily come under his lordly control. By the power of Hanuman, the energy operating at the plane of mind and senses is integrated, controlled, and channelized towards generating shubha samskaras or pure impressions. 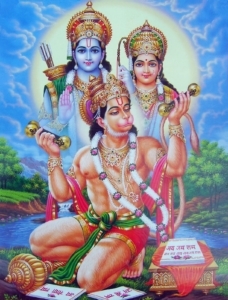 Hanuman is symbolic of atmabal – that power which enables one to go beyond the plane of relativity. The dazzling sun that he was ready to devour as an infant represents the total enjoyments of the world of relativity. A similar symbolism is adopted in the Hindu tradition when an aspirant receives initiation into sanyasa (the order of renunciation). At that time, the initiate is asked to look at the sun – representing the entire realm of time and space – and to imagine that the sun is trembling before his own spiritual effulgence. Hanuman symbolizes sadhana shakti, the power created by constant sadhana or spiritual discipline. He represents the spiritual strength that develops in an aspirant through satsanga, austerity, and persistent practice of the yamas and niyamas (the ethical restraints and observances). That spiritual strength is a blend of faith, purity, devotion, and insight. Endowed with that strength, one’s intellect becomes intuitive and one becomes the abode of all divine qualities (known in the Gita as Daivi Sampat). So Hanuman is a blend of all the best ingredients of sadhana. Without the grace of Hanuman, without atmabal, one cannot be led to Rama, one cannot attain Self-realization. The story of Jambavan’s awakening of Hanuman is a reminder that Hanuman’s immense spiritual power is hidden or sleeping in every individual. Every soul is essentially SatChitAnanda – existence, knowledge, and bliss absolute. But one has to be reminded of his essential nature, reminded of the inner grandeur that he has somehow forgotten. Through satsanga and the influence of guru, that Self-knowledge is awakened. Everyone has within him the “sleeping” Hanuman – the soul force needed to cross the ocean of the world process, the ocean of illusion. This Hanuman has to be awakened by the guidance of one’s guru. When awakened, Hanuman enables you to cross that mystical gap between you and your unconscious and enter into the city of Lanka, where the basis of ignorance resides. We hope that you enjoyed this brief excerpt from Mysticism of the Ramayana. If this teaser has enticed you to seek additional insight, then we look forward to seeing you on Sunday as Swamiji expounds further. The festivities begin promptly at 5 PM so be sure to get there early if you have seating preferences. For a much deeper and more profound understanding of the relationship between Lord Rama and Lord Hanuman, then click the link above to pick up a copy of the text.